Hi! I'm just popping in for a minute with dessert. I’m taking a two plus week hiatus from technology to ride bikes, swim and picnic with my kiddo. I also plan on spending time with favorite foodie friends doing some carefree summer cooking. It will be strange to cook and taste without writing a single ingredient down for a while. My Mactop will be locked away during this time but I should be back to posting recipes the week of July 12th. Unfortunately, spammers worship me so I’ve turned on my comment moderation for this break. You probably don’t want to read all the crooked and terribly perverted things they try to sell me. If you leave comments I’ll post them as I can from my phone and try to answer any questions. Just try to be patient with me please. Hope you’re having a fun and exciting summer! I adore my Ninja Blender. If you need a new blender these are worth checking out. They’re not too expensive and work better than anything I’ve used before. Blend all the ingredients together in a blender. Garnish with whipped cream for extra decadence. Have a wonderful time Laura and enjoy every minute. Thank you for leaving us with such a wonderful dessert! Beautiful images as always. And who would have thought of a malt-cherry combo! I am printing this malt recipe off! I can not wait to try! You have a fab time with your kiddo from your techie break! You deserve it!! What a wonderful summer treat. We are in desperate need of a new blender, so I will have to try the Ninja out! MMMMMMMMMMMMMMM it is perfect for a summer day. Especially this weekend! In my area it is suppose to be in the 90s. It may be time to find the blender to to this. Cherries & Malt-now that sounds good! I have a Ninja also. They make everything so smooth. Your food photos are beautiful! Have a great and well-deserved break!! This malt looks amazing!! Lovely photos as usual. Yum - I love malts, and a cherry one is extremely tempting! I'm jealous you have a Ninja - I ordered one from tv not long ago but the thing is on back order. I look forward to the day when it arrives. In the meantime, my trusty blender will have to do. Looks wonderful! I'll have to try this for my hubby. His favorite things, all rolled into one. Glad you shared! These are gorgeous - perfect for a summer break. Enjoy your time off! Hi Laura, nice to meet you. I followed you over from Butter Yum. Can't wait to try these shakes. I have a Bing cherry tree that will be coming on soon. It wasn't supposed to be a full sized tree, but it is and we have such huge volumes of cherries we are always looking for something to do with them. I have to go now and peruse more of your blog. Yum, I'm getting hungry. Had a lot of fun looking at your blog. Now I am even more hungry. I am your latest follower. Jacqueline it's nice to meet you! I'm so happy you like my blog. Thank-you. Cherry was always my favorite flavor for a shake growing up. I can't do ice cream anymore(very sad!). This looks awesome and the photo is just as awesome! 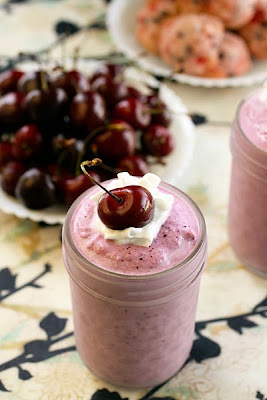 Mmm my bf loves milkshakes and I am obsessed with fresh cherries. I think this is something we could both get excited about :). What a great looking malt! Love the cherry flavor! Enjoy your break Laura. I feel that way during summer too. What a great summer treat! Have a great time. Hope you enjoy your time off, Laura. Thanks for leaving the great recipe for us, and don't worry about a thing...just spend time with your family. Absolutely stunning dessert. Love those cherries out there... Have a wonderful vacation with your kid Laura..
Hi Laura....I hope you're having a wonderful time doing all sorts of fun things on your time away. This sounds like quite the refreshing "drink" for a weekend like the one right around the corner! I'm obviously a bit late in getting around to reading posts this week, but wanted to say I hope you have a great trip! WOW! That looks gorgeous drink! Have a great trip Laura ... LOL on 'comment moderation'!! This drink looks FAB!! Love love love the flavour combination! Gorgeous pictures too! Those look so delicious and perfect for summer! I love the retro element to this dessert, it must be the malt! Sounds like a great thing to pair with burgers and fries. Holy Moly this looks fantastic. looks like i'm going to have to share my cherries with Carol. Love this post!